One of our favorite frying pans is the Anolon Nouvelle Copper Nonstick Skillet. It is a premium skillet with a copper bottom and hard anodized nonstick surface. We took a closer look at the features and reviews of this pan to bring you this in-depth review. Let’s jump right in. The Anolon Nouvelle Copper Skillet is considered a French skillet. That means that it has the wide, flat bottom of a frying pan and the sloped sides of a saute pan. While different skillet shapes work better for different cooking styles and foods, this style is a preferred one for everyday cooking by chefs and home cooks alike. One of the key features on this pan is the copper bottom. Copper offers excellent heat conductivity, giving cooks the feel of professional-level control. The copper is sandwiched between layers of aluminum and the bottom includes a stainless encapsulator that ensures this pan is induction-compatible. The Anolon is safe for the oven up to 500 degrees. The construction of the pan means that it does need to be hand-washed and stay out of the dishwasher. It is easy to clean, though, so it shouldn’t be a big deal to wash it after use — plus, we always recommend handwashing cookware even if it is rated dishwasher-safe. 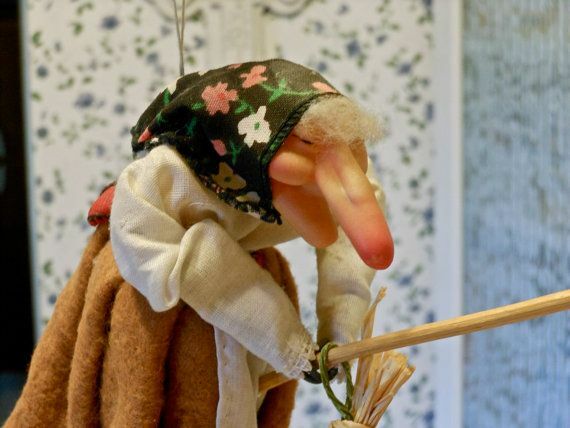 Also, because it contains PTFE, you will want to stay away from nonstick sprays like Pam. The Anolon skillet features a cast stainless steel handle, and the inner rivets are flush for a completely smooth interior. 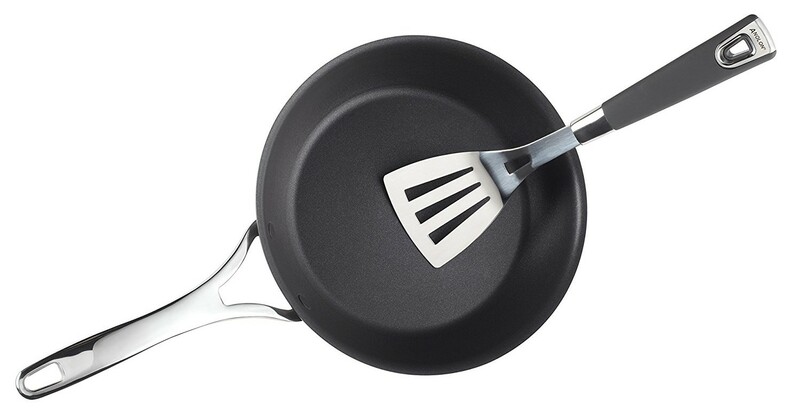 Anolon says that the pan can handle metal utensils without damaging the nonstick coating. That coating plus the Unity Surface with Easy Clean ensures easy release of food and easy cleanup. The dimensions of the 12″ pan are 19 inches long x 13 wide x 4.8 inches deep and it weighs 3.39 pounds. Anolon offers a lifetime warranty on their products, which is an excellent addition to this hard anodized nonstick skillet. Anolon is part of Meyer, which produces some of the best-known and highest rated cookware in the world, like Circulon, Farberware, Paula Deen and Rachael Ray brands, and more. 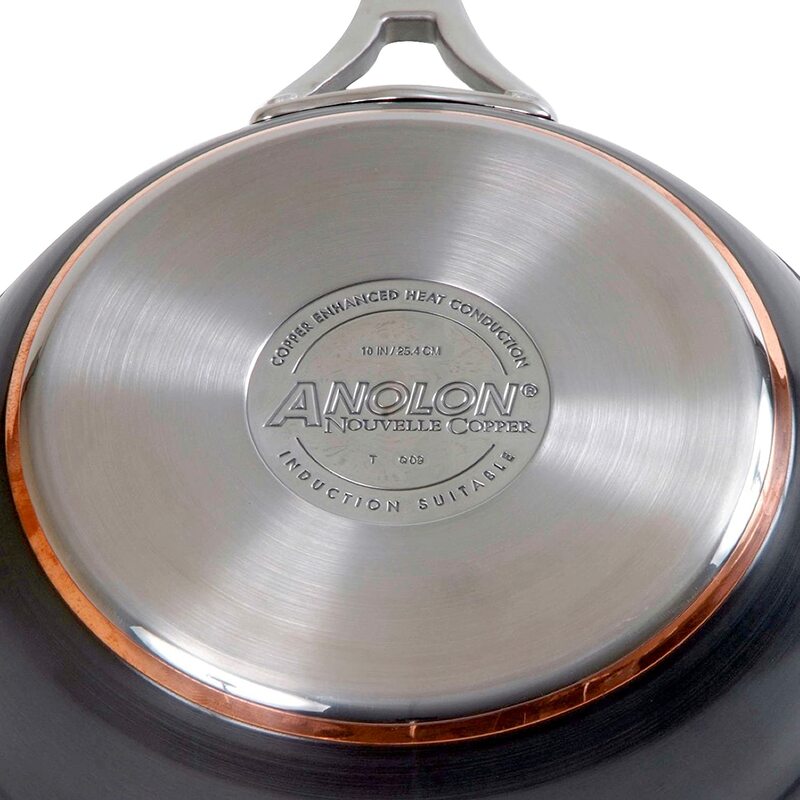 Anolon was created in 1984 and in 1987 launched the very first flat-surface gourmet hard-anodized nonstick cookware. In 2009, this line of cookware, the Anolon Nouvelle Copper collection became the first hard anodized cookware with a copper layer. Today Anolon is still highly regarded as a gourmet cookware brand for home cooks and chefs alike. Anolon cookware is manufactured in China, Thailand, and Italy. Let’s take a quick look at the top pros and cons of the Anolon Nouvelle Copper Skillet. Bottom line? We have very few complaints about this pan. It’s a high-quality, premium skillet, so you will pay more for it. However, it’s a great upgrade and is the sort of pan you won’t hesitate to use daily for practically anything.